The Aerochute Dual is a simple and safe way to fly. The Aerochute Dual is a two seater powered parachute designed specifically with safety and ease of operation in mind. It cannot stall or spin and in the case of an engine failure it simply lands safely as a parachute would. The Aerochute takes off from the ground with the parachute behind you. Once the engine is started the propeller blows the canopy up and the Aerochute takes off within 10 – 15m. Climbing and descending is controlled by using power through a foot throttle. Steering toggles (similar to parachutists) are used to turn left and right. Landing is achieved by backing the power off and flaring the parachute just above the ground. The parachute is an 15 cell Ram Air canopy. It is 370 sq. ft. and made of a rip stop nylon. The parachute is designed not to stall or spin. The engine is a Rotax 503 two stroke. It puts out 52hp. and is used with a 2 or 3 blade propeller. The fuel capacity is 30L which can give up to two hours flight time. The Aerochute is a form of aircraft registered under the civic Aviation Safety Authority definition as a Power Parachute. The Aerochute is a factory made aircraft conforming to strict civil aviation safety standards and is approved under civil aviation order 95-32 of the civil aviation saftey authority (CASA). However, unlike traditional aircraft that have either a joystick or steering column that controls the three axis of flight, an Aerochute is flown just like a parachute. Climbing and descending is controlled by using power through a foot pedal throttle, steering toggles similar to parachutes are used to turn left and right. Landing is achieved by backing the power off and flaring the parachute just above the ground. The best times for flight are early to mid-morning and early evening. This is when the air is smoothest and the thermal activity (those hidden bumps) are at their minimal. 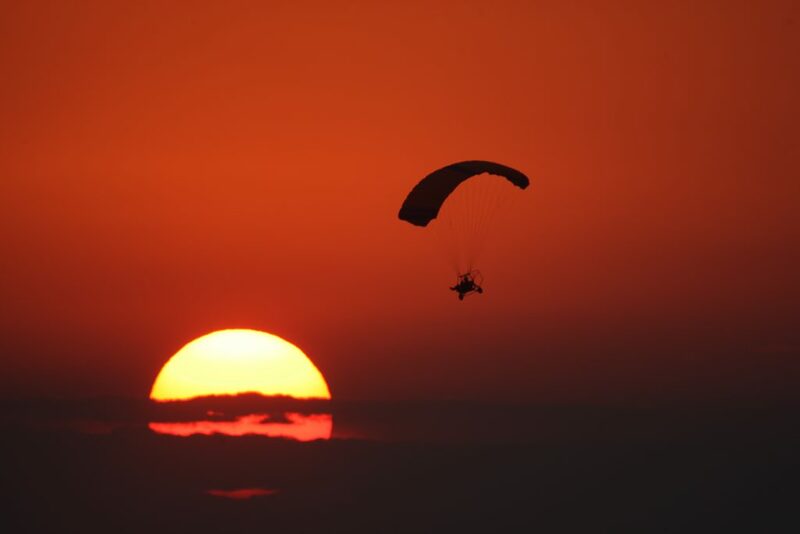 The first flight in the morning is the sunrise flight and provides an awe-inspiring view of the rising sun with its array of colours on the distant horizon. The last flight of the evening is the sunset flight, and the same captivating sights of the setting sun provide a beautiful array of colours. Flight times are predominately determined by the wind strength and heat of the day. Strong winds and very hot tempretures create unstable air, which is not fun to fly in, therefore our instructors are extremely sensitive to our passengers comfort and will not fly if they consider the conditions unsuitable.